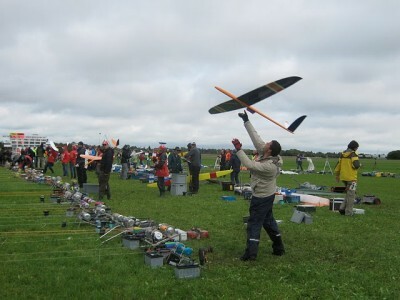 F3B is the international FAI contest formula designed for Radio Controlled Sailplanes. F3 indicates radio control soaring, the last letter (B) indicates the specific event. F3B – Is multi-task soaring where one model airframe must be flown in 3 entirely different tasks. 3 tasks comprise a round – all flown with the same aircraft. Launch is typically by a specially limited winch with 200 meters monofilament line to the turnaround. Task 1. Duration – very similar to standard US MoM contests, fly for exactly 10 minutes in a 12 minute window and land on a spot. Flown MoM with group scoring allocating 1000 points for the best combined flight + landing score. Task 2. Distance – Fly as many legs as possible in a 4 minute period within a group window of 6 minutes. A leg is 150 meter course -Fly back and forth as many times as you can in the 4 minutes. No landing points. Flown MoM with group scoring normalized to 1000 points for the most legs flown. Task 3. Speed – fly 4 legs (2 laps) of the 150m course as fast as you can. Not MoM but each round the fastest time gets 1000 points and all others a percentage thereof. The scores from all three tasks comprise your score for a round, then add up your rounds for a total contest score. 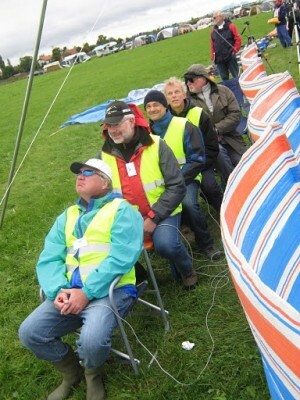 This type of contest with a composite sailplane is very demanding and exhilorating for the pilot and helpers. It does require a little more work as helpers are needed to time and count laps and call turns as the aircraft arrive and turn at base B during the distance and speed tasks. Usually contests are flown with 3 man teams to facilitate the assistance required by each pilot. As one pilot flys the other two assist etc. If you are interested in soaring and can make it to the Space Coast in early March 2012, this is a “must attend” event. You can come along as a spectator or alternatively fly in the event for an experience to remember. Everybody is welcome regardless of your skill level. There will be expert pilots available to assist you to learn the ropes. This explanation of F3B was taken from the Team USA F3B site and is an excellent explanation of what F3B is all about. The F3B class is the Formula 1 of the Sailplane model classes, it’s the High-Tech class without technological limits. The contests are a tremendous challenge, thrilling, and ask for power of endurance and team spirit. A few years ago a young team had the name SAF-Team where the capitals stand for: Speed, Action and Fun. making, the tactics, and in running across the flying field. by the different contest tasks. in the same flying task. In the winch launch, which is the beginning of each contest task, the model starts in a situation with high lift and low speed, but jumps off the winch line when approaching ca. 70 degree. winch line angle. At that moment the model accelerates within 2 seconds from the initial 30 km/h to a speed of ca.180 km/h, followed by half a loop to rotate into a nearly vertical climb at low lift coefficient to gain maximum altitude. G-force: Because of the expected loads during the winch launch of the model the wing spars are often designed with a load factor of 50. Remember a real fighter plane might pull 9 g maximum. The Speed range is from ca. 9 – 60 m/s. In combination with the usual dimensions of the planes this means a real aerodynamic challenge because the models cross a large part of the Low Reynolds Number aerodynamic region. Moreover a design optimization at a single operating point (like cruise speed for airliners) is not possible. One has to seek for a suitable compromise. As you can expect the construction of these models at the required weight (ca 2.5 kg empty) is only possible with modern materials like carbon, aramid and glasfibre laminates. The model parts are made in negative moulds to give a high glossy aerodynamic finish and precise shape. All 3 tasks must be flown with the same model. Only the addition of ballast is allowed or an aerodynamic change of the model when applied by remote control, for instance in the form of camber changing flaps. Most current models have a combination of the aileron, camber changing and brake functions spread out over four wing control surfaces. This is possible with modern computer radio controls. Most pilots use separate flap and trim settings for the different tasks. Every task begins with a launch with an electrical powered winch. Hand-towing is also allowed but only practiced during severe back-wind situations when it is possible to out launch the winch by hand. The normalized F3B winch consists of a 1.1 KW, 12V car starter motor, with a line drum on the axis. 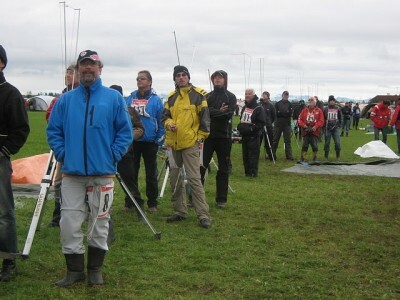 The winch is placed at the line were the models start and were the pilots and coaches stay. Maximum 200 m away a turnaround pulley is fixed. The nylon monofilament starting line is thus 400 m long, running from the winch towards the pulley and back. A small drag-chute must be attached to the end of the line to signal the release of the model at the end of the start and allow a controlled winding down of the line. A maximum of 10 pilots flies at the same time. From the start signal every pilot has a 9 minute working time to complete his flight. In this working time the pilot has to fly exactly 7 minutes from release of the winch line. It is allowed to re-launch the model; the last attempt counts. The flight should be completed with a spot landing. The flying time is stopped when the model comes to rest on the ground (or in a tree ) Points will be deducted when the model flies shorter or longer than the 7 minutes and points will be deducted for every meter the model is farther removed from the landing spot. The maximum score is 420 sec. + 100 landing bonus points. This score, or the best score in the group of pilots flying at the same time is converted to 1000 points. The other pilots get a partial score. In general it is necessary to find a region of air with thermal lift, or at least to avoid sinking air to manage the 7 minutes. The best pilots manage the time often within 2 seconds and are seldom more than 1 meter from the spot. 4 to 6 pilots fly at the same time. After the starting signal the pilots have 7 minutes working time to fly as much laps as possible within a 4 minutes flying time. The laps are defined by two parallel planes at 150 m distance, equipped wit sighting devices. Each time the models pass the line (called base A and base B) a signal is given to tell the pilot to turn. It is allowed to re-launch the model; the last attempt counts. The 4 minutes flying time starts each time the pilot starts the task when base A is crossed in the direction of base B. The pilot with the most laps in his group gets the 1000 points. Tactical decisions are to be taken in this task about the time and place were to fly the task. Control of flying speed and exact turns are important. Distance is the most challenging task for the team as a whole. The 1000 points may as well go to someone flying 8 laps or even 30 laps depending on the atmospherical circumstances during the working time. The pilots fly one by one. Every pilot has 4 minutes working time to complete his flight. After the launch the pilot must try to fly a 4 laps distance (4x150m) in the shortest possible time. The fastest pilot gets the 1000 points. The pattern flown is in general direct from the launch back to the base A line. There is little time to gain extra height in thermal as only one minute is allowed between the release from the winch line and the starting of the task. Before entering the speed course one has to dive to get the initial speed, after the dive into the speed course the glide angle is smoothly leveled out till at the end of the task the model flies almost horizontally with decreasing speed. Just after the dive the speed is up to 180 km/h, at the end of the task the speed could still be 100 km/h. The task can be flown in around 20 seconds; the better pilots fly under 20 seconds consequently. The absolute best time flown at a contest was 14.24 sec. by Espen Torp from Norway at the World Championships 1997 (during World Air Games) in Turkey. In this task the timing and efficient use of height are important as well as adapting the wing loading to the atmospheric circumstances. In order to fly not to much distance the model should be rolled to the appropriate bank angle before the base line is crossed. Experienced pilots will make the speed turns even before they get the audio signal from the line judges, they just know they will be over the base line only one or two meters. This task has the biggest luck factor in the F3B contests because the pilots fly one by one and the thermal lift circumstances change rapidly. In F3B contests the three tasks together make up a round. For each round the total score is compiled by adding the partial scores of tasks A, B, and C. A contest consists of several rounds; 2 or 3 rounds at small contests and at least 5 rounds at European or world championships. If more than 5 rounds are flown, the lowest task-scores are cancelled to reduce the factor of bad luck even more. · Tour Program CONTEST Euro Tour F3B – “Vestpokal”. · Quiet Flight International – Beginners notes on F3B by Ian Rose.